Banner Health – Artworks PHX – a business-arts campaign in Phoenix, Arizona USA. Banner Alzheimer’s Institute enriches patients’ lives with the arts. 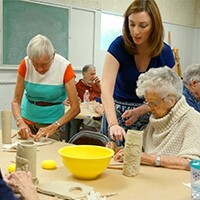 Studies show that arts and creative expression activities stimulate cognitive thinking that enhances the lives of patients with Alzheimer’s/dementia, as well as their care partners. With this in mind, the Banner Alzheimer’s Institute launched an Arts Engagement Program in 2008, that was the first of its kind in Arizona. 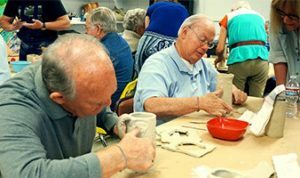 The program consists of collaborations with arts and culture organizations that offer participants and their care partners a variety of opportunities for socialization, and creative expression. In partnership with ASU School of Music Therapy and the city of Tempe, “Making Music, Making Memories” provides weekly music therapy sessions that are held in at the Pyle Adult Recreation Center. ASU music therapists facilitate sessions allowing participants to sing along, play an instrument, and drum or tap along. In partnership with the Phoenix Center for the Arts, “With Art In Mind” offers weekly classes where participants have hands-on opportunities to create works of art in a variety of mediums. Through a partnership with Phoenix Art Museum, patients and their care partners can enroll in an eight-part program that includes interactive docent tours of special or permanent exhibits, followed by thought-provoking, in-gallery or hands-on activities, and lunch. There’s also “B-Sharp Music Wellness,” a one-hour Friday Coffee Concert series in partnership with The Phoenix Symphony that includes a pre-concert discussion at Symphony Hall. Although there is no reversing the effects of dementia and Alzheimer’s disease, the innovative collaborations that Banner Alzheimer’s Institute has established with the arts community helps enrich the lives of more than 500 patients and their care partners each year. These arts outings provide entertainment, mental stimulation, and give everyone involved a chance to socialize and experience the joy of living.